On the banks of Bay Creek: What if? 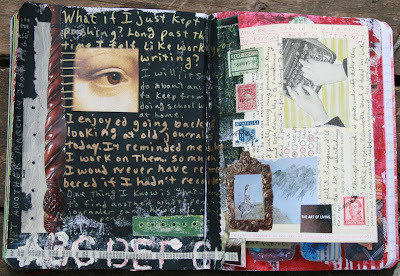 I could post a page a day for a long while just catching up on my journal pages. Maybe I will. I was embarassed, just now, to see that I've only made two posts this year. Both of those were this week. Michelle's latest Street Team Crusade has got me motivated to post. I just love adding text to journal pages. 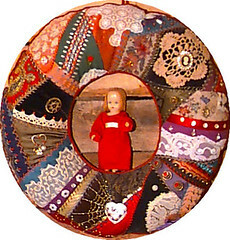 In fact my first forays into paper arts were altered books. I loved the fact that the books already had text on them. Anyway, I wanted to post the above page. 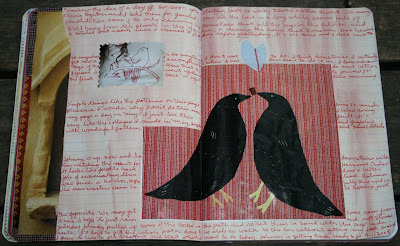 I'd had the black birds quilt image laying around and wanted to get it into my journal before I lost it. The page was done last Labor Day. I love the way the writing turned out mimicking the stripes on the quilt. It's fun to go back and read too, now that it's close to the end of the school year. The next couple of pages are more recent. I like the way the text flows on the one above. I did all three spreads in one marathon session, pushing myself to do just one more page. The bit of text inside the photo of someone's garden journal was a bit of a mistake, brought on no doubt by my decision to journal quickly without thinking too much. I had the photo laying on my abismally messy worktable. In the rush to add images to the page, I cut the flowers from the back of it. When I turned it over to add glue, I realized what I had done. I flinched a bit and glued it down, and then grabbed what was left of the photo and glued it down too. I love the way the two pieces look together. They remind me of two ladies facing each other. 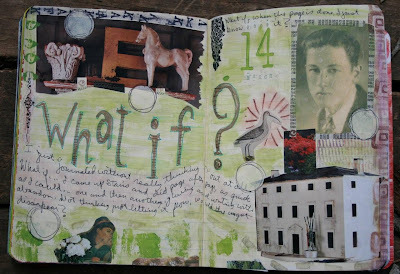 I've used the technique of writing inside a photo where someone's body has been cut out on other journal pages. I'm not a big fan of gluing photos of just anybody in my journal. The person's face has to appeal to me. If it doesn't I cut the person out of the photo and use the spot to journal in. I'll try to look up one of my favorites and repost it. 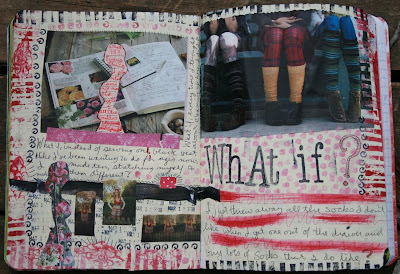 When I first started adding visual things to my journal, I just changed the style of my writing. Page after page of the same looking text was starting to bore me. I love to write in different pens and different directions when I change direction in my thoughts. I'm truly not a lineal thinker. My thoughts bounce all over the place. This style of recording them suits me. Dawn - what a great post! Thanks for some of the insights into why and how you write on a page, and that adding imagery made the writing more fun. It's great to see more of your work. How cool to know the crusade got you back on the blog train. Yay! Your pages are wonderful! I love the way you integrate the text and the images. That is something I really struggle with but this challenge is helping me loosen up. RAD pages! I like how you put the text in with your photos - this is a struggle for me sometimes! I'm with you-love the variety of writing on a single page. Makes great interest. Thanks for sharing your inspiring pages! You were definitely on a roll that day! Love how you used the journal photo after accidently cutting it. It looks like it was done on purpose, very cleverly!